Light, creamy and refreshing lime-flavored cheesecake. Lime zest perks up the graham cracker crust while sour cream topping adds sweetness. 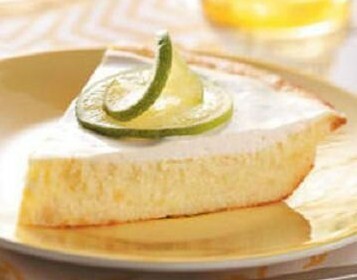 Here is an easy dessert recipe for Lime Cheesecake. Combine graham cracker crumbs, sugar, lime peel and melted butter in a bowl and stir until well mixed. Press the mixture evenly over the bottom and up the sides of a 9-inch springform pan. Bake for 5 to 6 minutes. Set aside to cool. Turn oven temperature up to 375°F (190°C). To make the filling, combine cream cheese in a bowl and beat until light and fluffy. Gradually add sugar while continuously beating. Add eggs, one at a time, beating well after each addition. Stir in remaining lime peel, lime juice and vanilla. Pour the mixture over prepared crust. Bake for 45 minutes or until the center is just barely set. (A small area in the center may still appear a bit moist, but it will cook a little longer even after you remove it from the oven.) Set aside to cool. Turn oven temperature up to 500°F (250°C). Combine sour cream and sugar in a mixing bowl; stir well and spread evenly on top of the cheesecake. Bake for 5 minutes to set top layer; remove from oven and cool to room temperature on a wire rack. Refrigerate the cheesecake for at least 8 hours before serving.